Jaws is one of the most beloved thrillers in film history. Steven Spielberg gave birth to the summer blockbuster as we know it with Jaws, but he also introduced people to the new wave of rebellious directors with his unabashedly brazen approach to making the film. Spielberg himself admits when he took on the project he just figured he could hire a shark wrangler for the scenes involving the Great White Shark at the story’s core. Little did he know such a thing did not exist and he would have to innovate all new ways of filmmaking to bring Peter Benchley’s book to life. Jaws: Memories from Martha’s Vineyard has got to be the most exhaustive book on the film Jaws. The sheer amount of information in this book is staggering. Even if you just browse it for the pictures, you will be kept busy for a long time. The pictures are incredible and from every aspect of the film from location shots to behind the scenes to publicity stills. But it is in the text of the book that you really get to the heart of things. Matt Taylor has done his exhaustive best in bringing you every tidbit of information regarding the legendary film. When Spielberg decided to film in Martha’s Vineyard, he picked a place of relative isolation, therefore making hiring locals a necessity. Among the locals hired to work on Jaws were actors, laborers, and photographers, and I think Taylor talked to every one of them for this huge book. He gathers many professional and amateur stories and photos to chronicle the making of the blockbuster and to hear the story of the film from the perspective of the locals on set is a unique and fascinating approach. Spielberg also lent his own voice to a forward for the book, and Taylor has included interviews with the production designer, Joe Alves, screenwriter Carl Gottlieb, and location casting director Shari Rhodes as well. We don’t often hear about the process of filmmaking from the legions of everyday people who make them, but Jaws: Memories from Martha’s Vineyard gives us just that, allowing us unprecedented access to Spielberg’s process and the process of filmmaking in general. The gigantic coffee table book will be a prize among your movie books. At 11”x12” and weighing in at almost 5 pounds, this book is worthy of bearing the story of Bruce, the Great White Shark that captured our imaginations, redefined summer movies for all time, and scared millions of people away from the beach for years to come. 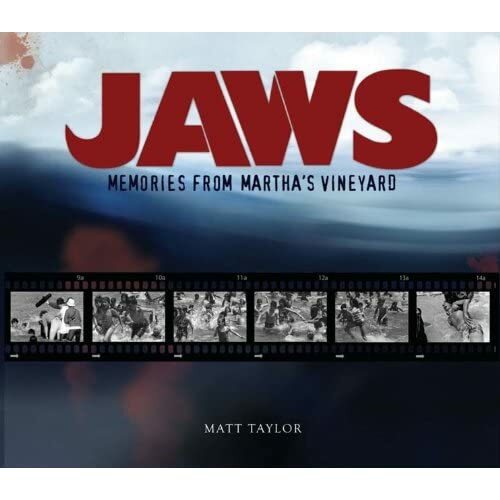 For the Jaws fan, the Spielberg fan, or any movie fan wanting a unique perspective into the process of filmmaking, Jaws: Memories from Martha’s Vineyard is an essential component of any film lovers library. Highly recommended.